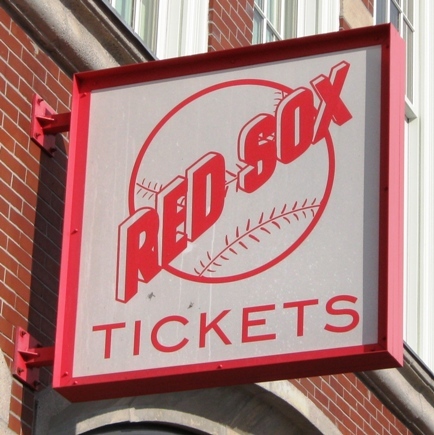 There’s a lot to know about every type of Fenway Park seating…from Dugout Box to Standing Room, every seating area in Fenway has its quirks. For example, I’ve dedicated an entire page on this site to avoiding obstructed views in the Grandstand. Remember, the support poles are your friend. 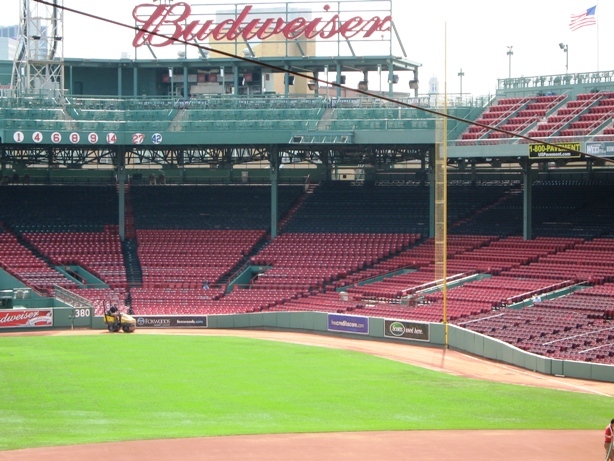 Fenway Park Seating, Tip #1) Pavilion Box. If you can lay out a few more bucks than it costs for Grandstand or Bleachers seats, Pavilion Box seats are a good bet. They’re more spacious than most seats, there’s no problem seeing over anyone, and on the first base side especially you have a beautiful panoramic view of the Green Monster in all its glory and the spectacular visual that is Fenway. Some people have nothing nice to say about the support poles in the lower level, but this is where they come in handy…they bring the upper level much closer to the field. Most ballparks have club seats at this level, so the view is pretty sweet. The only real drawback is the lack of concessions choices; most of the available offerings up here are pretty simple. Best to get your grub on in the Big Concourse or Jersey Street beforehand. It’s Samuel Adams now, so the beer is better too. Fenway Park Seating, Tip #2) Right Field Box. The Right Field Box seats may cost a little more than the Grandstand or Bleachers, but as far as seat comfort and view, you’re getting more bang for your buck with it. If you’re sitting in Sections 6-8, or Sections 95-97, you’ll see all of the action of course, and your seat will be a bit more comfortable, without any poles in your way. Not to mention you’ll be able to stare straight ahead at the Green Monster. When my wife consulted my father on what seats to get me for my birthday, he considered that a selling point. The only caveat is that when you get closer to the foul pole, seats are facing straight ahead at center field rather than being angled towards second base or something, so you’ll have to have your head turned for most of the game. This can get a bit annoying, especially when people walk in front of you. But in the sections I’ve listed here, it’s not much of a problem at all. Red Sox fans like to sing Neil Diamond songs to the opposing right fielder. 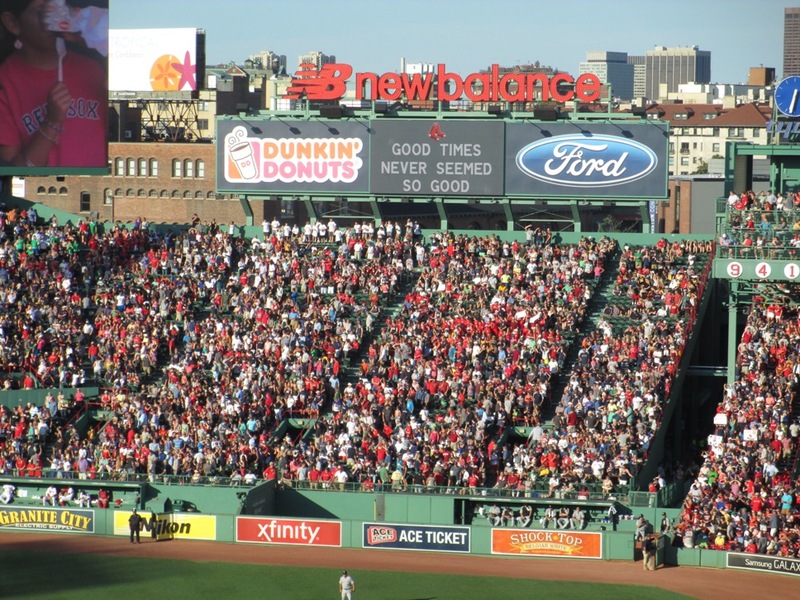 Fenway Park Seating Tip, #3) Bleachers Knowledge. Bleacher seats at Fenway are okay and inexpensive by Fenway standards. In some cases they are a better alternative to Grandstand seats. But you should know a few things. The most important thing is that there’s zero protection from the sun, so bring a hat, sunscreen and sunglasses, seriously. You’ll be staring almost directly into the sun at sunset and for day games it can be brutal. There is also at least fifty (yes, fifty) rows in most bleachers sections, and there’s no shortcut to the high rows, so get your grub in the Big Concourse nearby and take care of nature’s call beforehand. If you like having more than one beer, get two at a time and be careful getting back. I’ve read that the Sox are adding a concourse with restrooms and concessions at the top, but 50 is still a lot of rows. Try to get the lowest row if you can also because from Rows 40 and up, it can get difficult to follow the action. 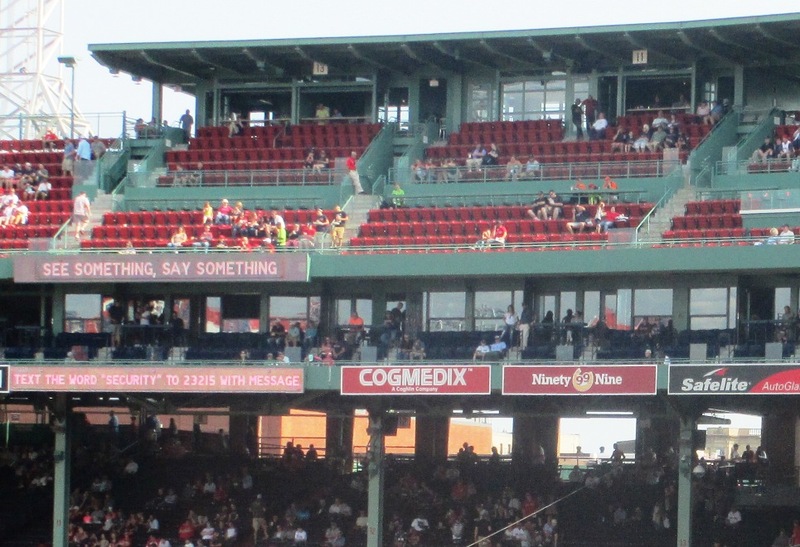 There’s three super helpful Fenway Park seating tips; but as I’ve said, there’s something important to know about every seating area at Fenway. Don’t sit in a bad seat for nine innings…think ahead.